Like many others, we sent up a weather balloon to observe the 2017 solar eclipse. The balloon took a few great pictures of the shadow cast by the moon on the earth! A link to an album with more photos is here. The photos below were taken with the Xiaomi Yi action camera, which is a great cheap GoPro alternative. We also sent up a Samsung gear 360 camera to take panoramic photos, but it was mounted outside the insulated payload compartment and stopped functioning before the eclipse was visible. Balloons that fly on solar power – what could be better? Unfortunately, the physics of these balloons is complex and reliable data on how they fly is hard to come by. 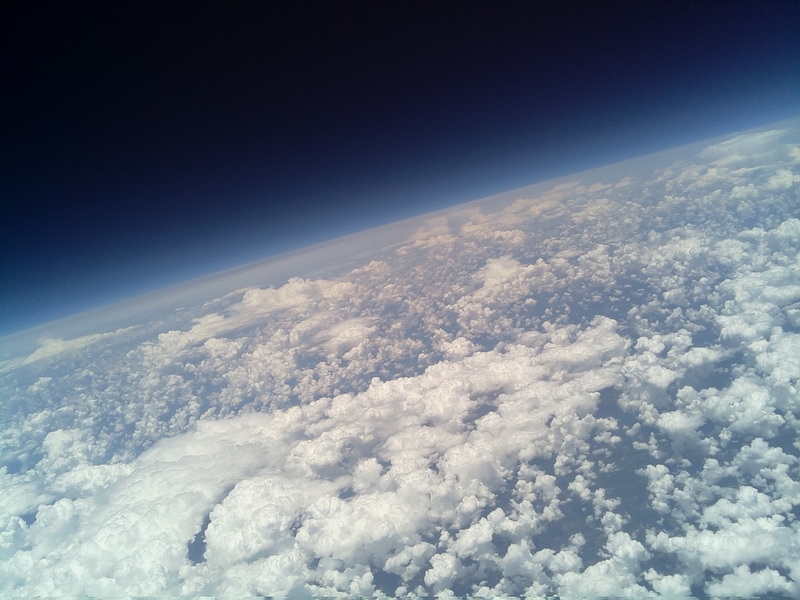 On this blog, we’ve discussed our attempt to come up with a numerical model of solar balloon flight as well as the data set from our solar balloon that made it to 22 km (72,000 ft) last May. 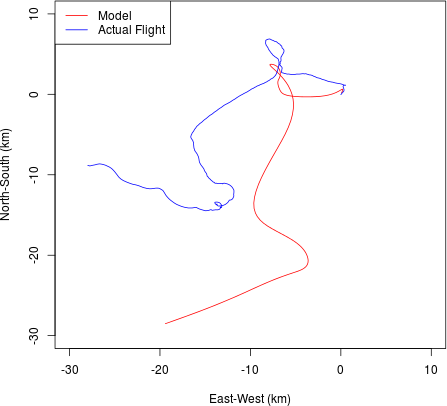 In this post, we present an empirically-derived solar balloon flight model based on data we collected on the high altitude flight mentioned above. First off: a disclaimer. This model is generated from data collected by one flight of a specific design of solar balloon. While we hope that it captures some general features of a solar balloon flight, we can’t be sure. Furthermore, different balloon designs and atmospheric conditions will cause inevitable (and at this point, unpredictable) deviations from the model we describe. Take it with a big grain of salt. We smoothed the GPS altitude data from our high altitude launch and performed a 1st order Tikhonov regularization to derive an ascent rate versus altitude model for our solar balloon. The plot is below, if you want the numbers click here. Modelled ascent rate versus actual ascent rate for our high altitude solar balloon. 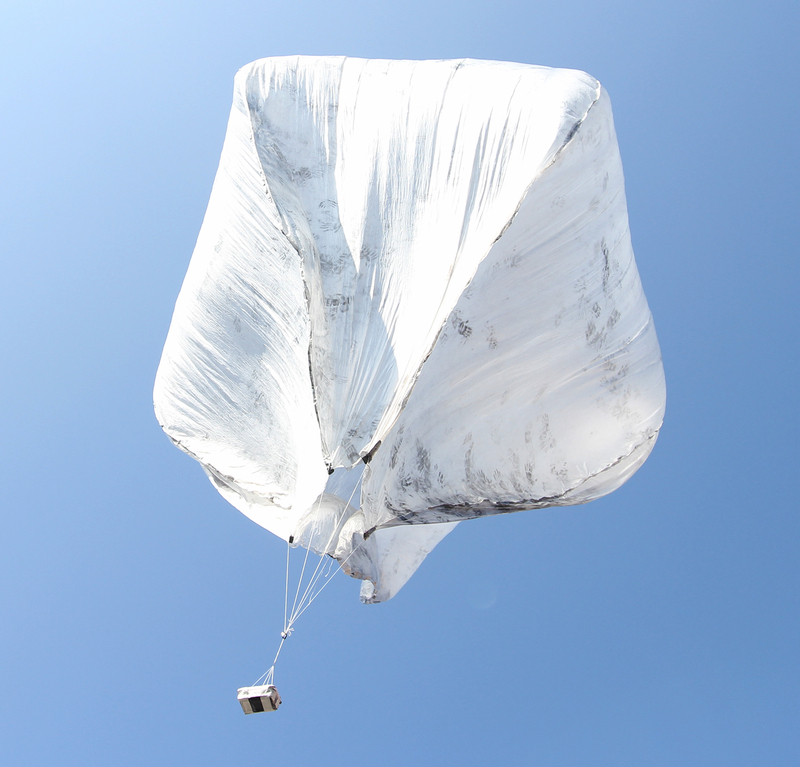 The solar balloon initially ascends at about 1.5 meters per second, reaches a maximum of about 2.5 meters per second at around 15 km elevation (just below the tropopause), and rapidly decreases as the balloon approaches neutral buoyancy at 22 km elevation. This is fortuitous, since the strongest winds in this elevation profile typically exist in the region where the balloon is ascending the fastest. In contrast, the lower stratosphere (18-22 km) is usually calmer. 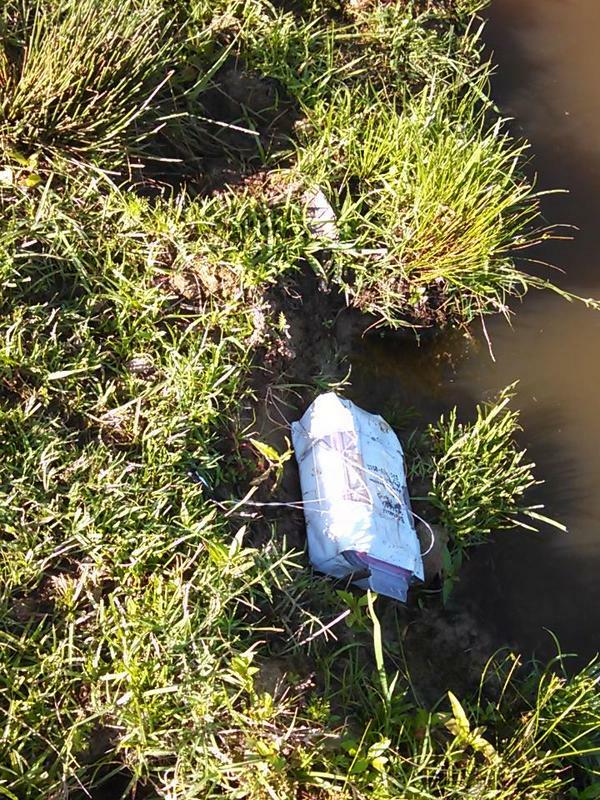 The exciting possibility in this trajectory data is that we may be able to park future balloons in this low wind “sweet spot”, and thus recover payloads relatively close to the launch site. 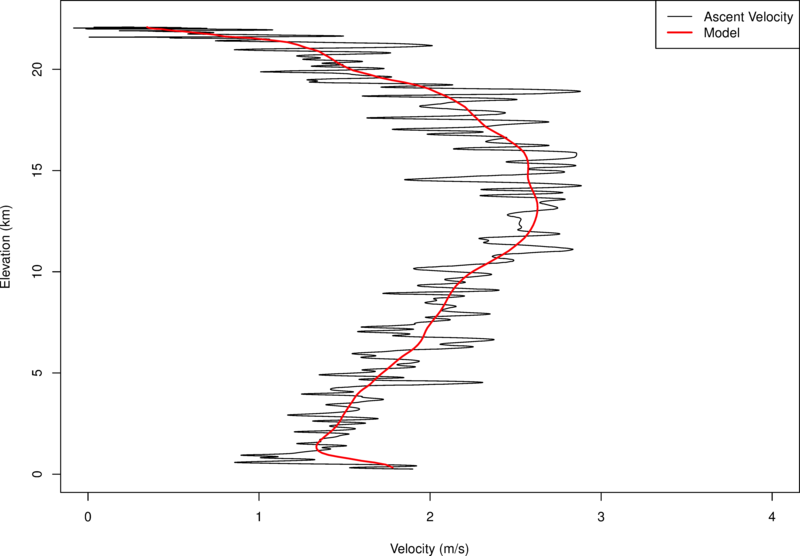 The modelled ascent rate lacks the vertical velocity oscillations in the real data; this is by design. We suspect those oscillations are either due to gravity waves in the atmosphere or uneven heating of the balloon envelope. In any case, we would not expect to see the exact same ones on future flights. Furthermore, removing the oscillations has little effect on the accuracy of the ascent rate model, as the plot below shows. 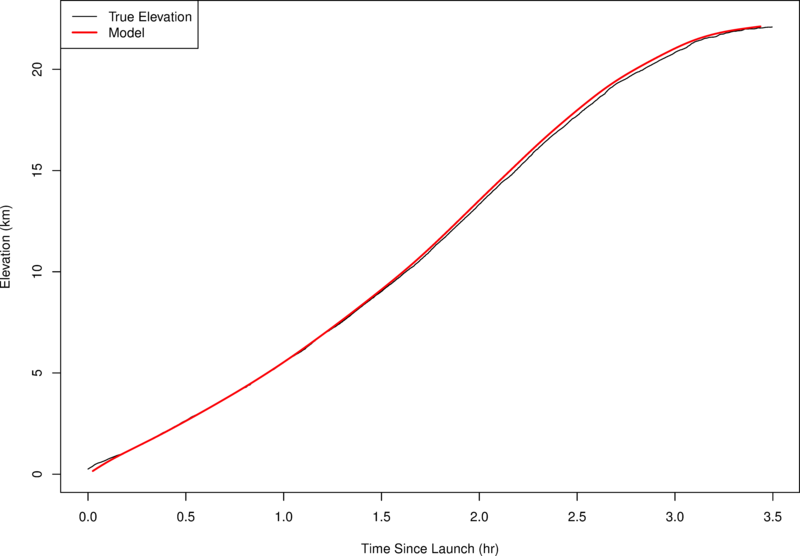 Modeled elevation vs actual elevation for the May 29, 2015 high altitude solar balloon flight. Modelled versus actual ground path of the high altitude solar balloon. Example of a modelled solar balloon flight path. The green diamond is the launch site, the red line is the ascent, the dashed line is 8 hours of drifting at neutral buoyancy, and the blue circle is the predicted balloon location around sunset. It may not be perfect, but it sure beats what we used to use.